Please tell me I am not the only person who drives through their neighborhood and stares at all the houses. When I go out walking I tend to peep into windows just a tad too long. Please don’t call the five-ohs (hi mom- that’s slang for cops) I fully admit to being a creeper but I mean no harm. I oogle pretty doors, and swoon over landscaping. Most of the time I see a house I love and I can’t quite put my finger on what I love about it. Those are always my favorite, because it is all in the details. The perfectly level green grass, the landscaping rocks that surround brand new mulch, the pretty porch light that matches the house numbers that match the screen door. One thing I have begun to notice is crazy mismatched curtains. You never notice the homes with nice clean matching curtains, but you better believe those red bedroom curtains will always catch your eye. Especially when mixed with the bamboo curtains in the living room and the white sheers in the bathroom. A crazy mumbo jumbo of window treatments. Get that under control number 4256. After a few hundred nights of pulling in and seeing our blinds all torn up from a psychotic dog that has figured out how to destroy manipulate the blinds into perfect guard dog positioning, I decided that consistent window treatments needed to move to the top of our project list. The next time we hit up the hardware store we beelined for the roman shades and commenced the “great shade debate”. He wanted Roman, I wanted Bright and Light. After quite a few arm curls with all the choices we landed on a white bamboo roman shade. The perfect compromise. It may not appear to be a major change to our neighbors, but this is the definition of an upgrade at this house. It is little things like these that pull your house together. Now I pull in the driveway and smile, until I see my dying ferns. Greenery hates me. Any tips for reviving ferns? 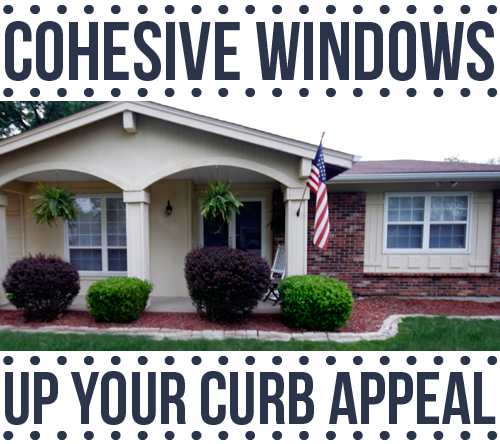 How do you up the curb appeal at your house? Your house is just like you… gorgeous. Can you believe that I don’t own a single curtain or shade? I’ve got those cheap-o blinds everywhere and never hung anything better. The cause: indecision. Awwww you are too sweet! Girl go to Lowes or Home Depot and check out their bamboo shades or roman shades. You can always put those on and then chose curtains later! They will make it so you walk past your windows and “ohhhhhh” and “ahhhhhh” all the time. There may be some heavy petting going on as well haha!!!! 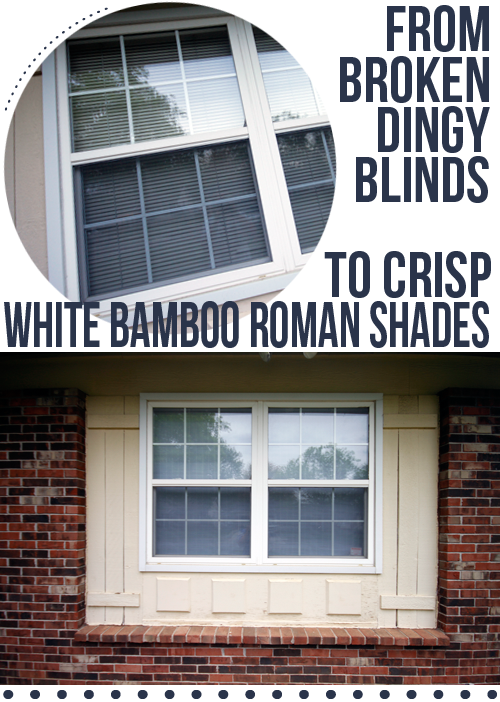 Do you think roman or bamboo shades typically stay with a house when selling it? I guess so, since a future house might have different size windows. I’ll look into it! Yup, that’s why I can never let him go. Even if he decided to leave me I will stalk his life until he does all my coding haha!!! Love that guy. aww your house is so cute! love your front porch. we’re working on our curb appeal too, lots of work to do unfortunately because the previous owner was a big old slacker when it came to outside work. it is definitely rewarding to see the improvements though, even if it is a slow process! We understand the slackers, ohhhh boy do we understand the slackers. But it is so fun seeing new life breathed into your home! And it is soooo worth it once it’s finished.